By default Salesforce suggest deployers to implement IDP-initiated SSO. The initialization of IDP-initiated SSO is little bit complex as it requires a big hostname which includes IDP's SSO link as well as SP's login uri. 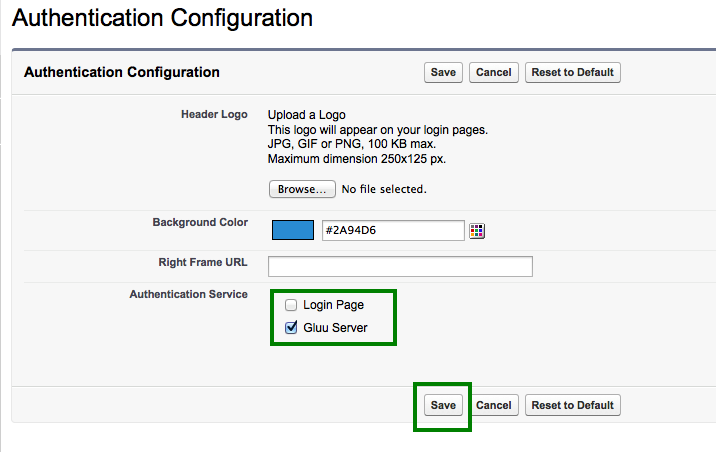 So we prefer SP-initiated SSO and here in this documentation we are presenting a very simple SP-initiated SSO steps with Salesforce and Gluu Server. Still, you can go for IDP-initiated SSO if you prefer. Further documentation is available at the Salesforce.com site. Log into Salesforce.com with your administrative account. Click on Setup in the right upper corner of the page. You need to add a custom domain name for your Salesforce.com site if you do not have any yet. Wait for some time. Salesforce.com will register this domain name for you. As an example we use testgluu-dev-ed.my.salesforce.com here. Identity Provider Certificate: Grab your Gluu Server's SAML certificate. 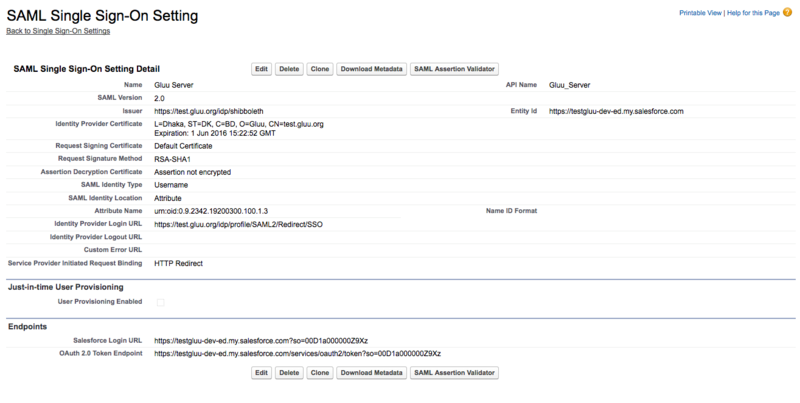 SAML certificate can be grabbed from your Gluu Sever's metadata. Save the certificate and upload it. Assertion Decryption Certificate: Assertion not encrypted. Attribute Name: Provide 'SAML2 URI' of your attribute. For our test case we are using Gluu Server's Email attribute. How to check the information of your attribute is available here. NameID Format: Leave this field empty. How to create SAML trust relationship is available here. Display Name: Anything, whichever is easier for you to recognize this trust relationship. !! !Note: This is a SP-initiate SSO. SSO needs to be initiated from Salesforce.com. You can watch a video demo of this SSO Here .